Such an odd year. Picked the rest of the green tomatoes, finally, which will turn into salsa, and will make ajvar out of the ripe peppers. Cooking down apples into butter in the crock pot. Ethiopian berebere peppers, which have a fantastic flavor, and a bunch of Hungarian paprika and others gifted by Jeff Eaton, who wanted to share the remainder of his crop (thanks, Jeff!) are drying in the dehydrator along with another gift, a tub of newly fallen walnuts (thanks, Lara!). Still haven’t figured out what to do with all those cranberries, but that’s next. 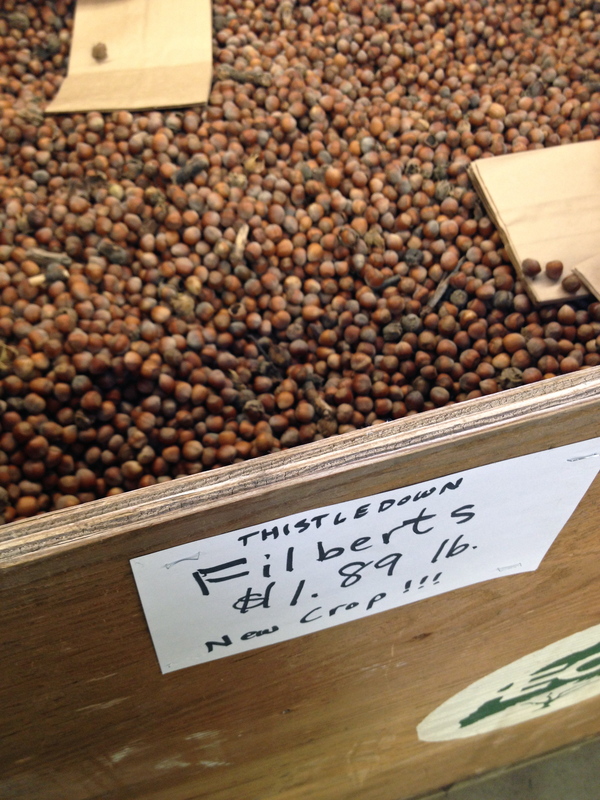 If you’re interested in going nuts, the filbert crop is in and walnuts are coming. I took some shots of the harvest at Thistledown Farm the other day. 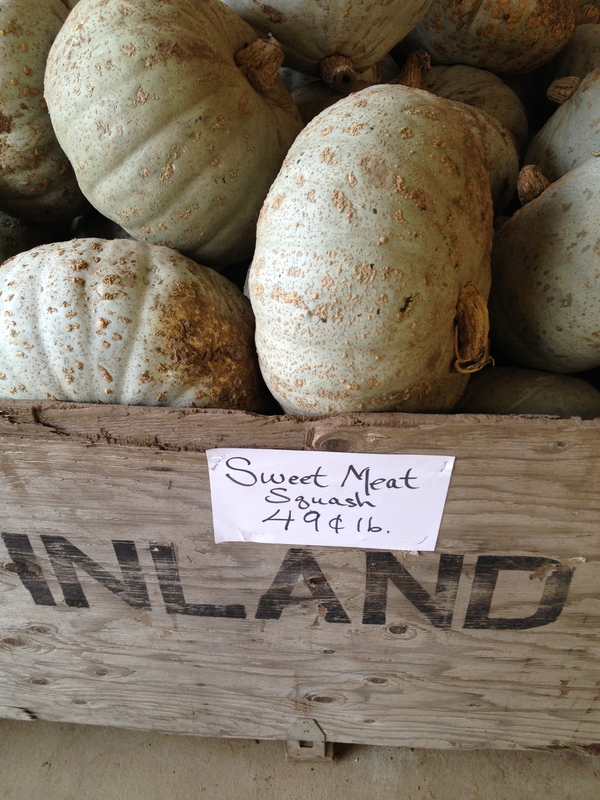 They close a couple days after Halloween, so if you want your store of winter squash, potatoes, onions, or apples, head out there soon. It’s a time to be amazed by the bounty of our valley. Even in a crummy year, we manage to pull it off. are you up to date on your ramen trends? After I returned from a year in Japan in 1994, I used to have to go to San Francisco’s Japantown for ramen. Sure, I could make it at home, and I often did. One of the mainstays of my college years was Sapporo Ichiban ramen, original flavor, which was fine for the gourmet because it was about double the cost of the cup-o-noodles you could buy at Safeway. I’d take my poison doctored with spices and topped by vegetables. My favorite? Diced okra, Brussels sprouts, and tofu. Good times. Sadly, the chewy noodles and traditional toppings ubiquitous in Japan were, unlike soba or udon, hard to find. You can now buy ramen in all manner of places, including Toshi’s Ramen in Eugene, and in the high-concept izakaya in Portland, like Biwa. I credit the popularity lately in no small part to Lucky Peach magazine, which tackled ramen for its first hipper-than-thou, swaggery, Bourdain-infused issue (next one out any day now, can’t wait). 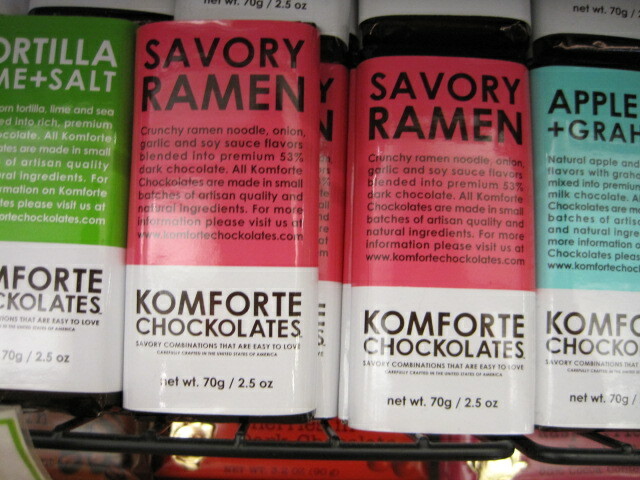 But there’s providing delicious ramen to the American masses, and then there’s jumping the shark. I have never made it a secret that I am perfectly happy to be bossed around by someone who knows what they’re doing. If I were in the culinary biz (and lucky to secure felicitous employment) I’d be an eternal sous chef. That might be why I’m such a happy customer when it comes to a well-run house. Imagine my surprise when, on my recent trip to Seattle, we landed in the good graces of a no-nonsense, helpful waitress at Chiang’s Gourmet in the Lake City neighborhood in NE Seattle (7845 Lake City Way N.E.). Our experience mirrors this humorous review, in which a white couple are initiated into the mysteries of Taiwanese-style dim sum. In my case, I was rather more arrogant about it all. (If you didn’t catch my latest appearance co-hosting KLCC’s “Food for Thought” radio program last Sunday, I talk about it here as my meal of the week). When asked if we had had dim sum before, I said we had, but I couldn’t understand which items were which because the Chinese translations seemed a little unusual, with many more “buns” and “cakes” than usual. Where was “har gow,” for example? If there is one thing I know, it’s har gow. She smiled at my ignorance and said that we were about to eat a kind of dim sum we had never had before: traditional Taiwanese dim sum. Had we really just chanced upon a completely new cuisine for me? We had been led to the restaurant by a recommendation, but in a very unusual moment for me, I hadn’t looked at any reviews or menus ahead of time. And I was kind of grumpy that we hadn’t been able to eat at my favorite Sichuan restaurant due to scheduling. So, basically, I had to trust someone…about food? Our waitress at Chiang’s Gourmet basically ordered for us, and we couldn’t be happier. I just wish we could have eaten more. Taiwanese food is something to which I have had little to no exposure, and it’s a varied and unusual combination of many regional Chinese specialties. The diversity is actually a bit startling. Oddly enough, my big Culinaria China book had only the sparsest mention of Taiwan. I had to study this guide on popular food culture just to get a sense of what the island offers. 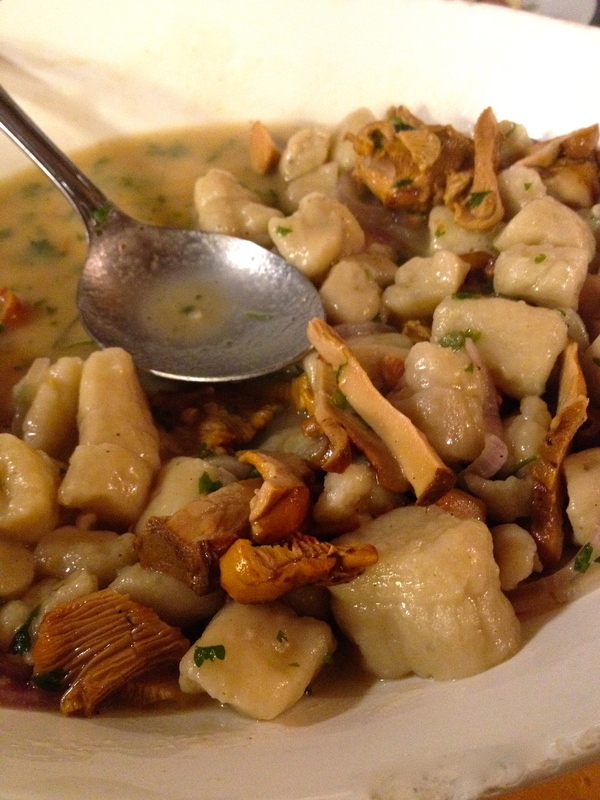 One of the main staples is pork, and there are indeed plenty of pan-fried wheat dough “cakes” that contain ground pork, like the flatbread we ordered, above, with minced, soured dried daikon. 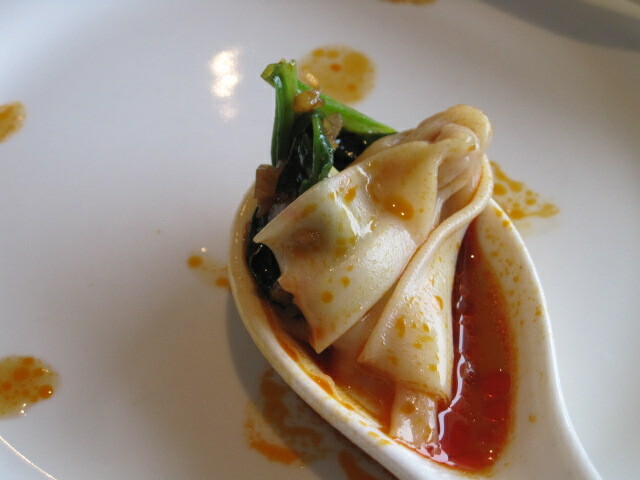 When she brought out a pile of garlic flecked gai lan and the spicy, soupy dumplings pictured at the top here, I thought I was in heaven. 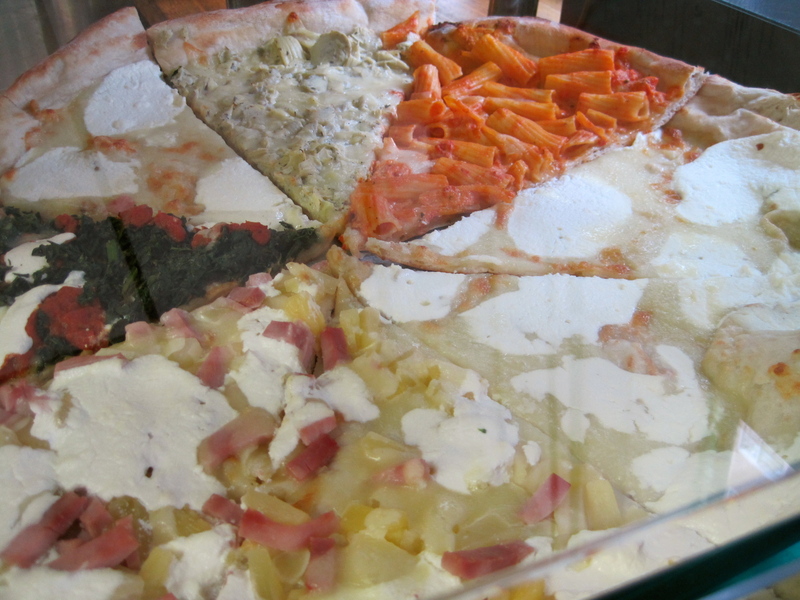 But when we received the above dish, I had no idea what to expect. 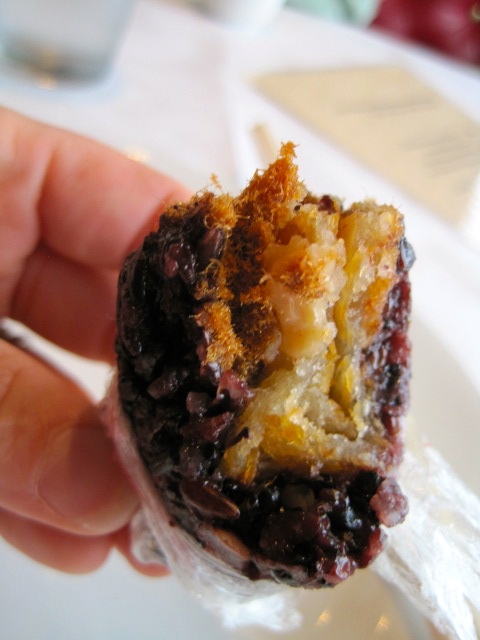 Glutinous purple rice steamed in plastic wrap was odd enough — and the interior, an odd mix of dried, shredded pork, a sweet powder, and the fried dough fritter usually served with congee? And yet the combination worked: a strange mix of all the five flavors, plus an interplay of soft and crispy textures in each bite. 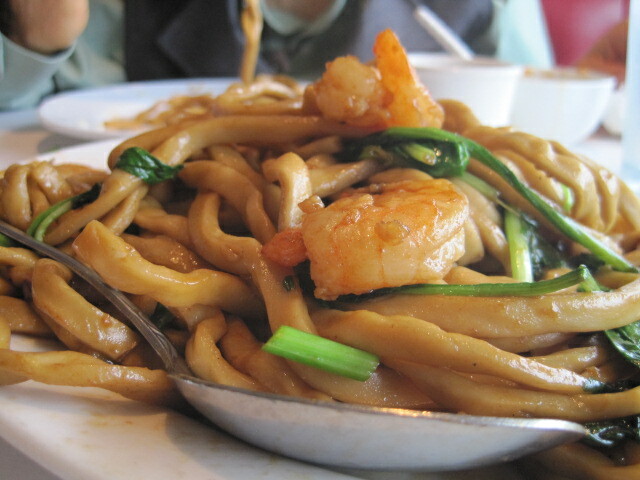 We finished our meal with hand-cut Shanghai-style noodles, shrimp and spinach, another house specialty. I’m sad that I missed the pork and sesame topping served to the table next to us, but we couldn’t go wrong with a dish like the above. And it gives us more reason to go back. I had been meaning to go to New York to catch a wholly different act, an exhibition of the life of Samuel Steward, one of Alfred Kinsey’s primary sources on gay life in the 1950s and the subject of part of my book on mid-century sexuality, so I thought I’d combine an important conference in my field being held in Buffalo and the exhibition all in one trip. 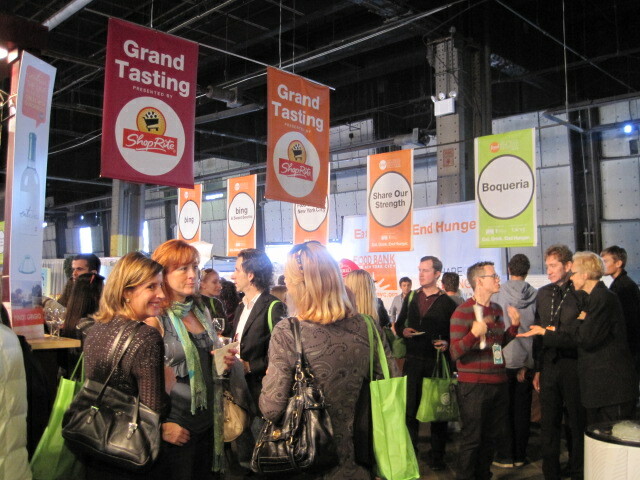 When I saw that the Food Network was hosting its annual Wine & Food Festival in one of the old Chelsea pier warehouses during the exact time I’d be there, I jumped at the chance to go to the Grand Tasting on Sunday. I’ve also been researching modernist menus — the fascinating clash of cultures in Greenwich Village in the first couple decades of the twentieth century — and post-modernist menus, in particular the way mainstream American media views the 21st century consumer. And what better way (if you can bear the high price) to contrast old and new American media than a Food Network event in the old meatpacking district? Above, that’s me standing on the old Cunard Lines dock (Pier 54) where the Carpathia docked with its unintended cargo, the Titanic survivors. And the apples in a pile? 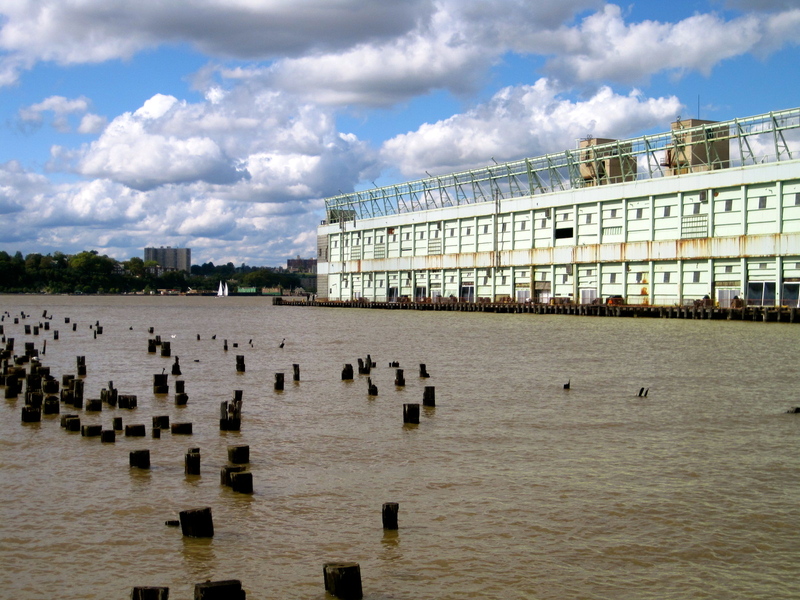 That’s the plan for Pier 57’s future. 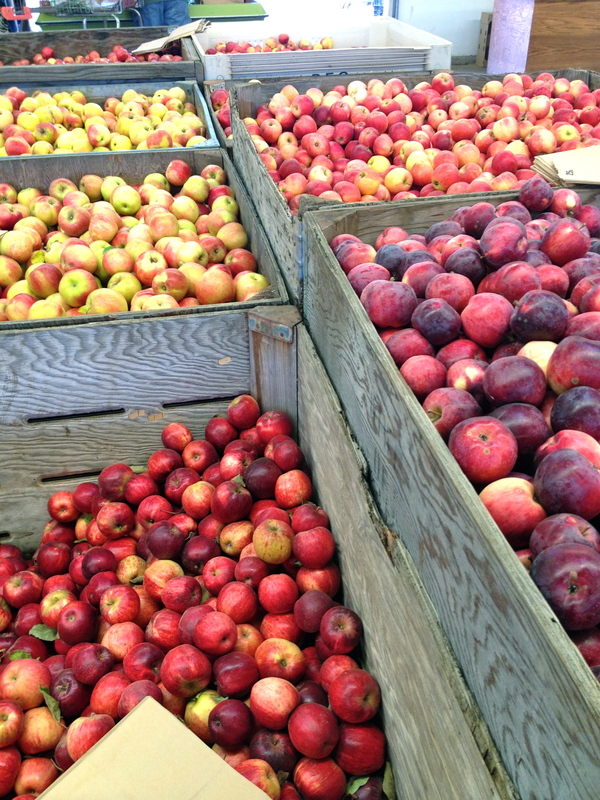 No, the Big Apple didn’t do its apples justice. 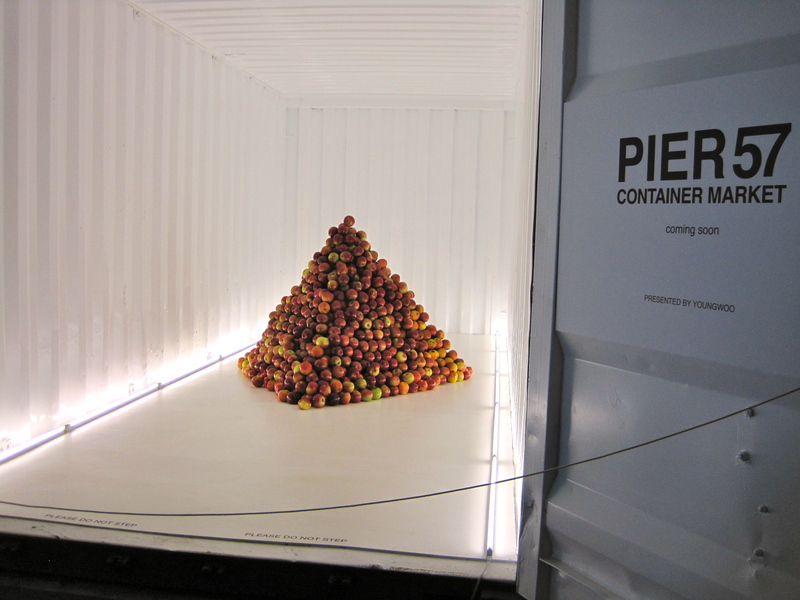 I eschewed the pile of refrigerated container apples and the supermarket ‘Red Delicious’ apples in the FN display. Red Delicious in fall, really? I like to think one jumped ship out of embarrassment. 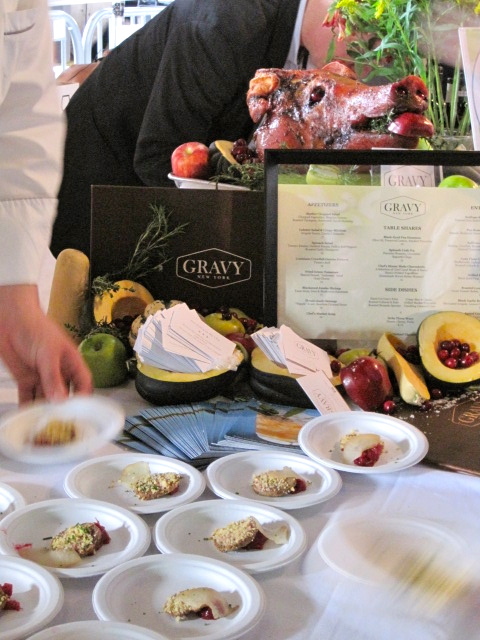 So while the Occupy Wall Streeters were assembling, I occupied the Grand Tasting, a benefit for local food organizations. There’s always something a bit off about mixing philanthropy and feasts to me, but they are always a quick and easy way to survey the territory. We received lime green bags with a baffling range of swag in it — everything from sour gummy candy to a regular-sized box of pasta to a pack of red chili flakes to a Nutella-like spread made from those Biscoff cookies Delta gives out on their flights. And Nutella. With wooden spoons and olive oil packets and concentrated chicken stock and a packet of electrolyte powder for good measure. More Biscoff cookies were distributed at the Delta booth, which occupied the space from which I’m photographing above. 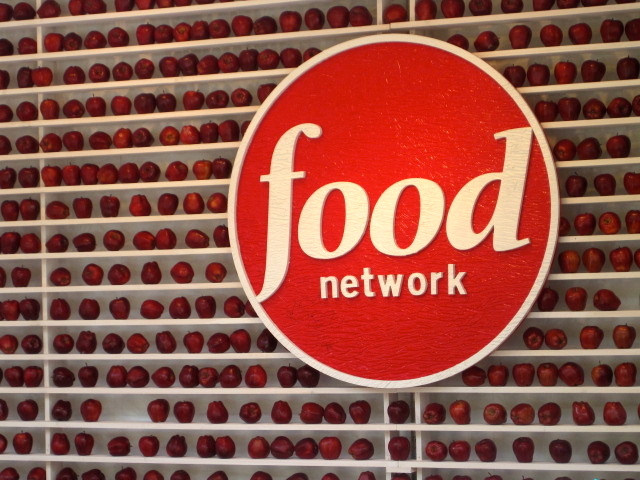 I’ll confess, I’m not really a Food Network fan. I used to be. I could happily watch Molto Mario all day long. In fact, in my early days of graduate school, I would use Mario as a study break. He managed to be both patronizingly didactic and still entertaining– he’d drive home the same point over and over again: undercook the pasta; add it to the sauce; don’t drown it; save the pasta water; and spoke at such a fast clip you could never quite follow the Italian names of dishes or regional variations he was introducing. It was a cooking show you actually needed to pay attention to. Food Network, you’ve come a long way, baby. 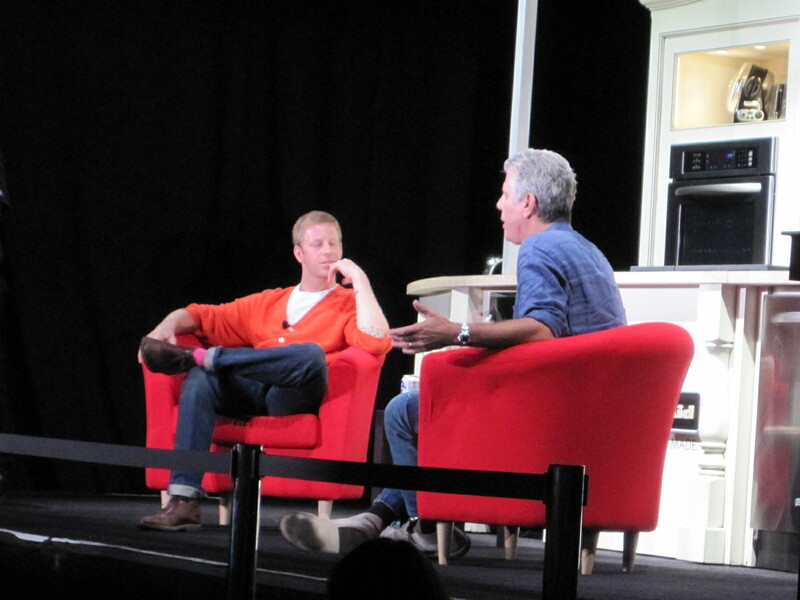 …and Anthony Bourdain, who had advertised that he was going to speak about being a sell-out. The first sentence of his conversation with the Destinations Magazine editor was “I am a whore,” but instead of being tiresome about it, he was actually quite entertaining and managed to convince people otherwise. 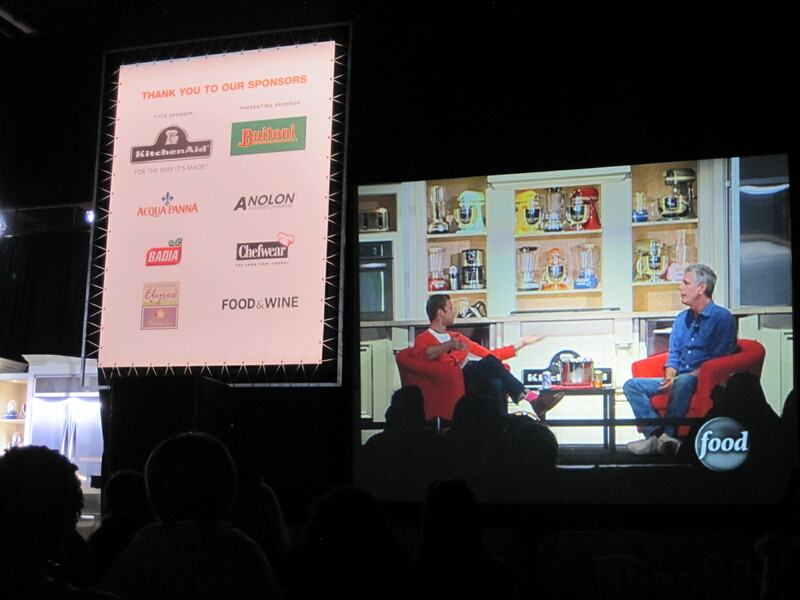 He spoke about the growing political side of his TV show on the Travel Channel, and didn’t mince words about the sponsoring network of the festival. 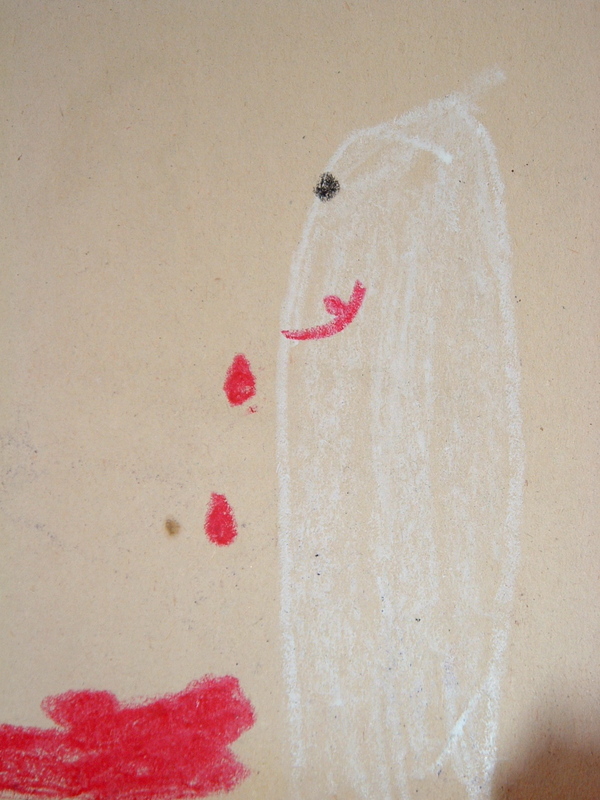 (He gained points with me when he said Molto Mario was the best FN show ever.) He discussed the resistance of various regimes to filming people in their countries. The Egyptian government, for example, steadfastedly refused to let Bourdain’s crew film regular Egyptians eating their daily breakfast of ful. 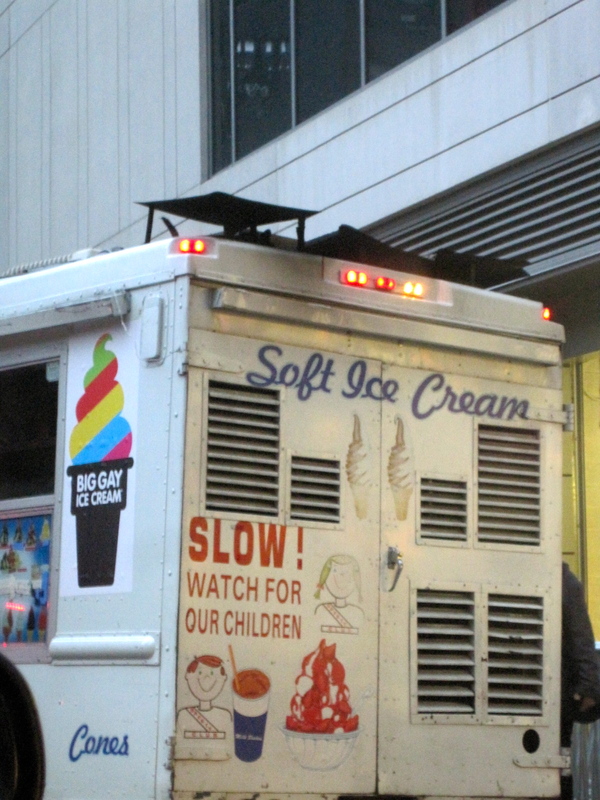 Hmmm, what media privileges one type of eating over another in the U.S.? And why? 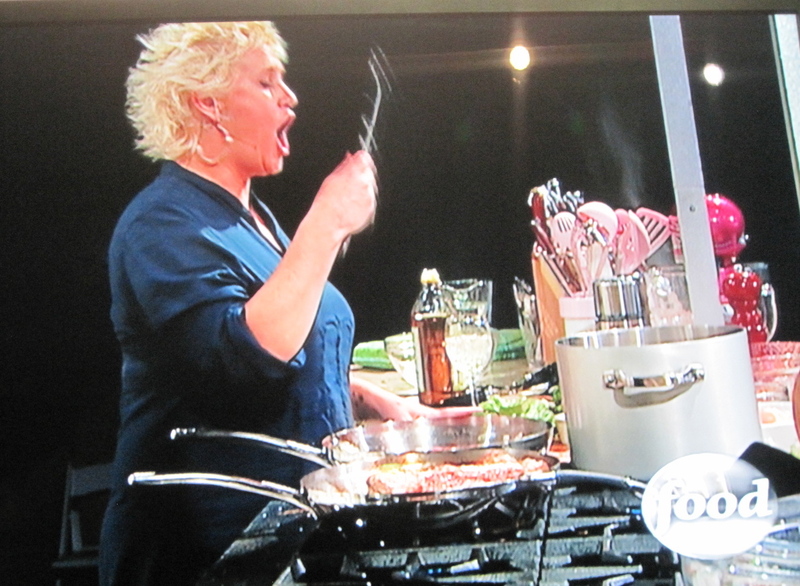 It’s something we might want to keep in mind when we think about a day like today, Food Day, in the U.S.
…a few people I didn’t want to see, like the Deen brothers, getting prompted by their mom in the first row, and Anne Burrell (above), whose picture says it all. Seriously, can’t we just focus on good cooking? That seemed to be the question of the day, and perhaps the focus of my research. When one deals with any media (this blog included) one needs to be wary of the message of its creators and sponsors. 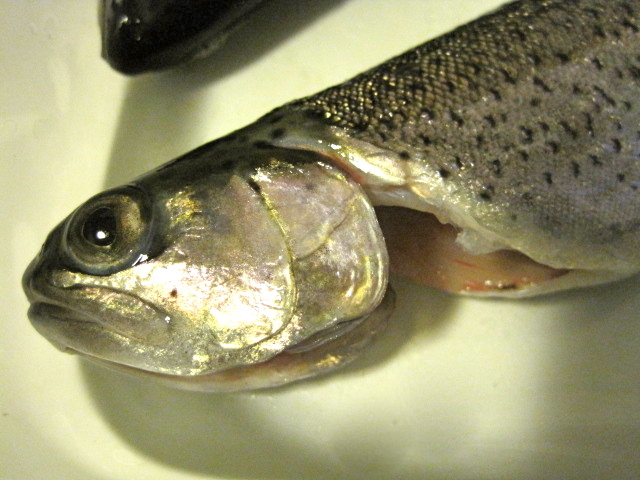 Running through the world of food is a slight distaste for eaters — a distrust, a disdain. 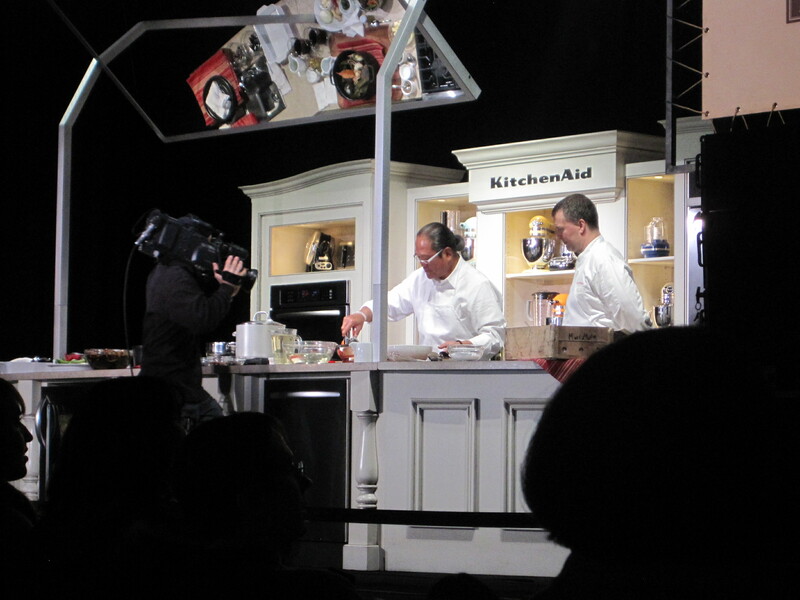 Most cooking shows not-so-subtly play on class anxieties and the brouhaha related to the American diet, but couched in rhetoric that carefully masks the corporate sponsorships needed to fund cooking shows and magazine. Not much we can do about the latter, I suppose, but it would be nice to not feel so dumbed down and manipulated into buying into every last trend. 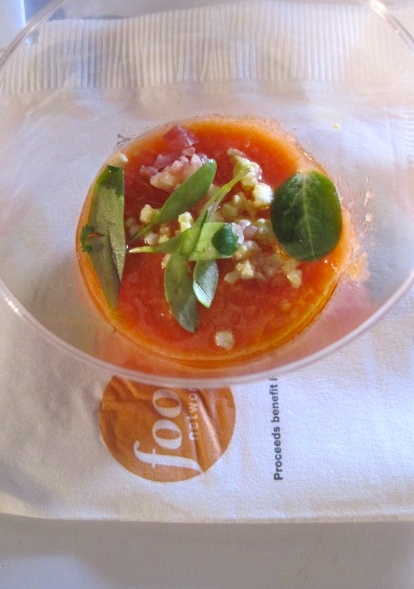 A delicious and simple gazpacho from Cordoba, served by Salinas restaurant. It differs from the usual by the addition of jamón, hard-boiled egg, and almonds. Yum. 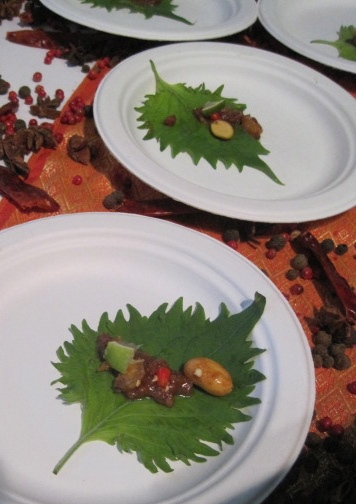 The leaf is Talde’s version of the Thai salad miang kum, in this case a shiso leaf that one wraps around a single peanut, a tiny chunk of lime, bacon tamarind caramel, candied chili, and dried shrimp. Worst bite was a drink: cake vodka. And not one but TWO vendors hawking it to the wedding market. I can’t imagine anything more vile. 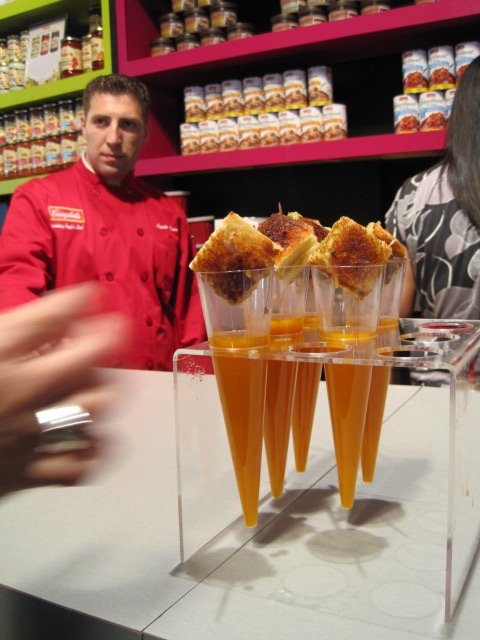 In the center aisle of the festival was a very popular set of booths offering bites made with processed food, like these cones of Campbell’s soup (tomato?) with what looks like grilled cheese sandwiches. 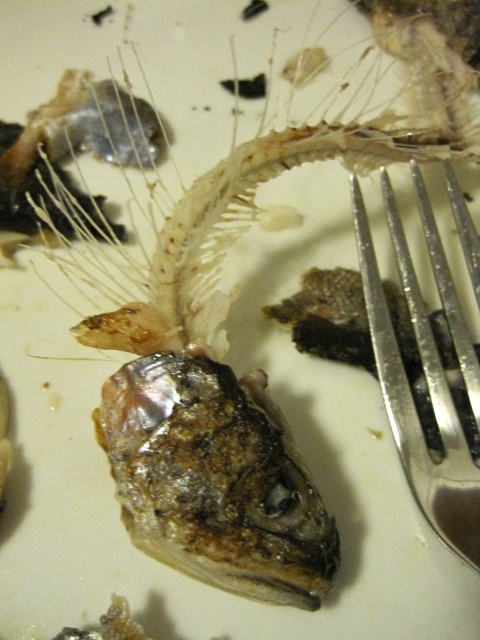 People ate it up, literally. I was pleased and surprised to see oysters in one booth. Here they were served ceviche-style with some plantain chips. Indeed, there were quite a few delicious seafood dishes, including a pickled mackerel with a persimmon purée and celeriac salad from August Restaurant that I had to try several times, wonderful house-smoked salmon bites from a German place whose name escapes me, and Aureole’s ruby shrimp with a micro salad and coconut broth. Also surprisingly, the West Coast obsession with variety meats and charcuterie wasn’t really represented well. There was one booth (above) with pig face, and a few sausages here and there, and a completely non-distinct but high-concept pickle booth (whiskey sour pickles that tasted like regular pickles, for example). Someone had a portable sous-vide, and braised short ribs and this-and-that sliders were popular. But you know what I liked best in New York, in a city full of choices like this? 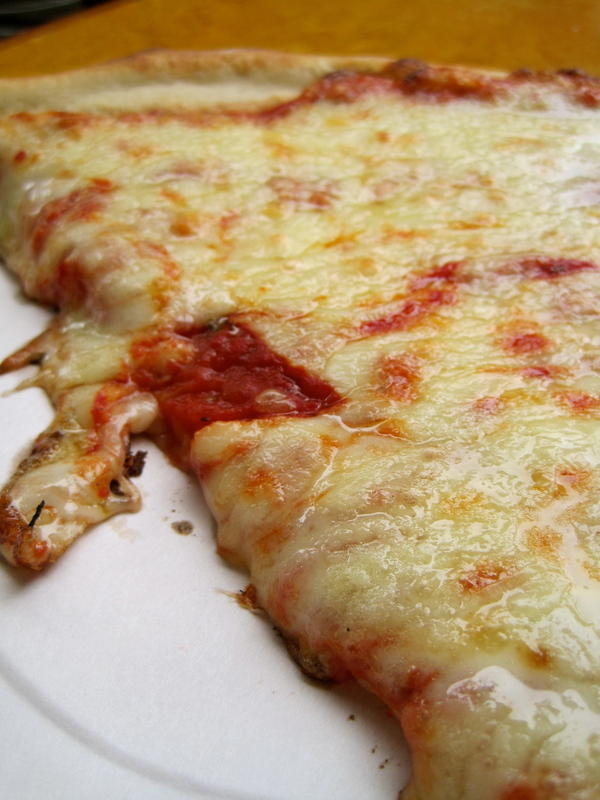 Yep, a slice of cheese pizza, eaten after doing research in the morning at NYU on a blustery day at a run-of-the-mill pizzeria in Greenwich Village. Even after eating as much as I could for several days AND missing out on Babbo down the street because it’s closed for lunch, that’s amore. Thanks, New York!